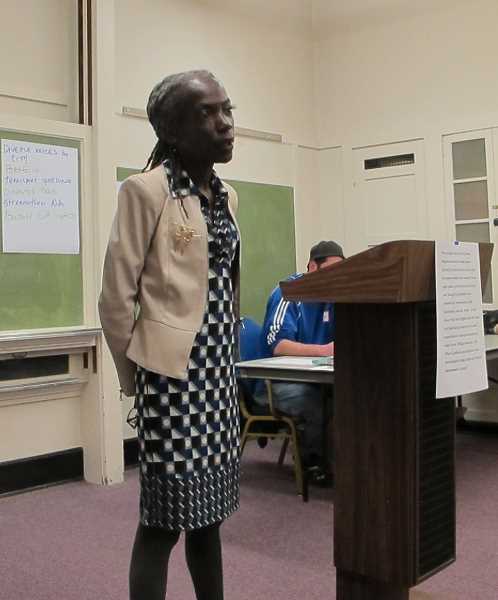 Hours after the Portland Planning Commission had narrowly approved a controversial zoning overhaul, Commissioner Jo Ann Hardesty told a mostly disappointed audience of 70 Multnomah residents she supports it. The Residential Infill Program, or RIP as it's known, would allow up to four units on a lot currently zoned for one single-family home and limit the size of new homes, among other major changes in Portland's zoning regulations meant to increase density citywide. The Multnomah Neighborhood Association, which hosted Hardesty on Wednesday, March 12, has been a consistent and persistent critic of RIP. Hardesty has been a supporter. This was her first appearance at any neighborhood association meeting since being sworn in on Jan. 2. There are 95 such associations in Portland. Hardesty spent most of the nearly two-hour session with the association defending RIP. More than once she said, "I respectfully disagree," and, "We'll have to agree to disagree." "Let's talk about the elephant in the room. Our population grew by 45,000 last year and by 45,000 the year before that and it's going to grow by 45,000 this year," she said. "We will have to change. Every single neighborhood will change. More infrastructure will be built and that's good. More people will be living closer together and some people think that's bad . . . People will continue to move here, so how does the city change? It changes so people at every income level can live wherever they want to." Addressing new concerns about the number of low-income residents who could lose their homes as a result of RIP, Hardesty said, "There are questions, for sure. But the Council won't consider this until July, or, more likely, September or October. So we have time to do it right." Portland's Planning and Sustainability Commission voted 5-4 earlier the same day to approve RIP and send it to the City Council for a final vote. Hardesty assured audience members concerned about the impact of RIP on Multnomah that there would, "probably be a couple of Council work sessions before we have a public hearing." "I support the infill project but not a cookie cutter approach. We need housing at every income level in the West Hills, in East Portland and North Portland and in every corner of the city," she said. Later, she added, "Southwest will have to have more housing. The devil's in the details." Click here to read the rest of the story in the Southwest Community Connection.